We´ve already talked about 2 out of 4 men´s major golf championships: Master Tournament and US Open. It´s time to move to Europe and take a closer look at The Open Championship. Is the oldest of the four majors, it dates back to 1860. And it’s the only major tournament outside the Unites States. When in 1859 Allan Robertson died, an authentic legend and the very first professional golf player, the golf world felt weird and empty. Therefore, the next year The Open Championship was organized. The purpose was to find a new golf champion who could replace Robertson. The first edition was held on 17th October 1860 at Prestwick Golf Club. That year only participated the professional golfers. There were only 8 of them, playing 3 rounds of 12 holes in just one day. The winner and, consequently, the successor of Allan Robertson was Willie Park, Sr. with a score of 174 hits. The next year they decided to let amateurs participate as well. Since then, The Open Championship is open for both professional and amateur players. At the beginning the tournament was only held on Prestwick Golf Club but in 1872 two other clubs started to organize it: St Andrews and Musselburgh. Nowadays the championships take place every year in a different place. There are 9 courses in the rotation. At the beginning, the only prize at the first three editions was a belt made of red Moroccan leather with a silver buckle, known as The Challenge Belt. There was no money price until 1863 when they had a prize fund of £10 which was distributed between the 2nd, 3rd and 4th best player. However, the winner only got The Challenge Belt. In the Championship in 2017 the total price was of $10,250,000. 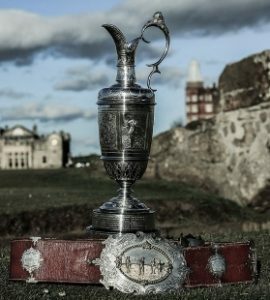 The Challenge Belt was an official price of The Open Championship until 1870 when Tom Morris, Jr won the tournament for the third time consecutively and he kept it as his property. It was replaced by the Claret Jug in 1873, an official trophy of the Open Championship made by Mackay Cunningham & Company of Edinburgh. In 1928 The Royal and Ancient Golf Club, the responsible for the tournament, decided to start using a replica of Claret Jug instead of the real one. Apart of the trophy, the winner gets Open Medals, which unlike the trophy, are kept by the winners. The Open Championship was a witness of many legendary moments in a history of golf. This was the first major championship won by Tom Watson in 1975. And also in 1984 the famous battle between Tom Watson and Seve Ballesteros took place at St Andrews when Seve needed a birdie on the 18th green to win the championship. He holed his putt and produced his famous celebration: a triple fist pump that became his personal trademark. If you want to feel more like those two golf legends Slazenger Heritage offers you jumpers inspired in them. Blue Golf Jumper of Tom Watson and Navy Blue Golf Jumper of Seve Ballesteros are both made from high quality superfine two-fold Merino wood. It´s a really soft and luxoury material that makes the sweater well-performed and practical. It has an excelent resistance to pilling and abrasion, but it´s still easy to take care. We have it available in many sizes from S to XXL. Don’t waste the opportunity to wear a legend. We hope that you enjoyed our post about the Open Championship and please, leave us comments what you think about it. We´d love to know your opinion. See you next time!